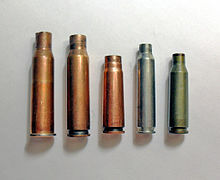 An intermediate cartridge is a rifle/carbine cartridge that is shorter than typical full-power battle rifle cartridges (such as the .303 British, 7.62×54mmR, 7.92×57mm Mauser, .30-06 Springfield or 7.62×51mm NATO), but still has greater length than pistol/personal defense weapon cartridges. As their recoil is significantly reduced compared to full-power rifle cartridges, fully automatic rifles firing intermediate cartridges are relatively easy to control. However, even though less powerful than a traditional full-power rifle cartridge, the ballistics are still sufficient for an effective range of 300–600 metres (330–660 yd), which are the maximum typical engagement ranges in modern combat. This allowed for the development of the assault rifle, a selective fire weapon that is more compact and lighter than rifles that fire full-power rifle cartridges. The first intermediate cartridge to see widespread service was the German 7.92×33mm Kurz used in the StG 44. Other examples include the Soviet 7.62×39mm M43 firstly used in the SKS semi-automatic carbine and AK-47 assault-rifle, and then the AKM series of assault-rifle, 5.45×39mm M74 introduced along with the AK-74 assault-rifle (officially replacing the AKM for front-line forces), and the Chinese 5.8×42mm used in the QBZ-95 series. Many years before the Second World War started, small arms designers of the world noted that the power of the full-power rifle cartridge was seldom used to the full extent. The late 19th century and early 20th century saw the introduction of smokeless powder cartridges with small caliber jacketed spitzer bullets that extended the effective range of fire beyond the limitations of the open rifle sight lines. At 2,000 metres (2,200 yd) and beyond, where these bullets were still lethal, a man-sized target would hide completely behind even the thinnest of front-sight blades. At great distance only large, soft-skinned area targets were vulnerable to rifle fire, and these were fired upon in salvos by whole units of riflemen. The Second World War saw the continued use of bolt-action rifles such as the Mauser Karabiner 98k, the Lee–Enfield SMLE, the Mosin–Nagant, the Arisaka Type 38, and Type 99 rifles, and during the early years, the Springfield M1903, as well as semi-automatic battle rifles such as the M1 Garand, SVT-40, and the Gewehr 43. These rifles weighed over 8 lb (3.6 kg), and they were longer than 40 in (1,000 mm) and as such inappropriate for close combat. They fired cartridges capable out to over 1,000 m (1,100 yd) but typical combat ranges were much shorter, around 100–300 metres (110–330 yd), rarely exceeding 500 metres (550 yd). Therefore, the potential of the full-power rifle ammunition at longer ranges was seldom needed. For close quarter combat, all the major armies began employing submachine guns (Soviet PPSh-41, US Thompson M1928A1, British Sten and the German MP-40) which fired pistol cartridges. Compared with the battle rifles, these submachine guns could provide high rates of controllable fire, but they lacked the power and longer effective range of the battle rifles. In 1951 the US military published the M1 Garand's fire rate; a trained soldier averaged 40–50 accurate shots per minute at a range of 300 m (330 yd). "At ranges over 500 m (550 yd), a battlefield target is hard for the average rifleman to hit. Therefore, 500 m (550 yd) is considered the maximum effective range, even though the rifle is accurate at much greater ranges". What was needed was a more compact, selective fire weapon firing a cartridge combining the power of a rifle and the controllability of pistol cartridges. The resulting cartridge would have the accuracy of the former for typical combat ranges, and the firepower of the latter at short ranges. The first cartridge fulfilling this requirement may have been the Japanese 6.5×50mm Arisaka used by the Russian Fedorov Avtomat rifle since 1915 (the cartridge itself dates back to 1897). The Fedorov was arguably the first assault rifle. Later came the US .30 Carbine, developed as a weapon for officers and rear area soldiers unlikely to be involved in infantry assault, but needing a weapon more effective than a pistol. Soon after came the 7.92×33mm Kurz round developed by the Germans in 1938, which was a shortened version of the standard 7.92×57mm Mauser round, and was used in another candidate for first assault rifle, the StG-44. When the Soviets developed the AK-47, they already had an intermediate cartridge of their own. Since the 1960s the United States, NATO, the (former) Warsaw Pact, the People's Republic of China, and other countries adapted relatively small sized, light weight, high velocity military intermediate service cartridges in the form of the .223 Remington (1964), 5.56×45mm NATO (1980), Soviet 5.45×39mm (1974), and Chinese 5.8×42mm (1987). These intermediate cartridges allow a soldier to carry more ammunition for the same weight compared to their larger and heavier predecessor cartridges, have favourable maximum point-blank range or "battle zero" characteristics and produce relatively low bolt thrust and free recoil impulse, favouring light weight arms design and automatic fire accuracy. In 2017 some commercial (including 6.5 mm Creedmoor, 6.5 mm Grendel, .260 Remington) and other non-commercial such as .264 USA (6.5×48mm) cartridges are under consideration as universal service cartridges by some militaries. The universal service cartridge concept intends to replace small caliber high velocity intermediate cartridges and full-power cartridges with a cartridge at the larger end of the intermediate cartridge spectrum, well suited for both assault rifle and general purpose machine gun use in the 6mm caliber to 7mm caliber caliber range, with external and terminal ballistic performance close or equal to the 7.62×51mm NATO and 7.62×54mmR full-power cartridges. The .280 British (7×43mm) and Czech 7.62×45mm were early attempts to create universal service cartridges. The US Army is also testing telescoped ammunition, polymer-cased ammunition and caseless ammunition for future service cartridges. If major militaries will actually radically replace the intermediate and full-power service cartridge mix used by most 21st century militaries by a universal service cartridge remains an open question. Service cartridges are cartridges the service rifles of armies were or are chambered for. ^ a b c Bull, Stephen (2004). Encyclopedia of Military Technology and Innovation. Greenwood. p. 25. ISBN 978-1-57356-557-8. ^ Hogg, Ian V. (1983). Modern Small Arms. United Kingdom: Bison Books Ltd. p. 136. ISBN 978-1-85841-075-3. ^ Williams, Anthony (6 Feb 2012). "Assault Rifles and their Ammunition: History and Prospects". Retrieved 4 Apr 2012. ^ Болотин, Давид (1995). "Глава 5. Автомат Фёдорова и унификация стрелкового оружия на его базе" (PDF). История советского стрелкового оружия и патронов (PDF)|format= requires |url= (help) (in Russian). СПб. : Полигон. pp. 156–165. ISBN 5-85503-072-5. ^ Nathaniel F (5 March 2016). "Caliber Configuration: How It Got to Where It's At, and Where It's Headed". tehfirearmblog.com. Retrieved 14 May 2017. ^ Nathaniel F (9 April 2016). "How Much Does Your Ammo Weigh?". thefirearmblog.com. Retrieved 14 May 2017. ^ Nathaniel F (10 November 2014). "The US Army Marksmanship Unit's .264 USA". thefirearmblog.com. Retrieved 14 May 2017. ^ South, Todd (7 May 2017). "New rifle, bigger bullets: Inside the Army's plan to ditch the M4 and 5.56". armytimes.com. Retrieved 14 May 2017. ^ Nathaniel F (5 March 2016). "Caliber Configuration: How It Got to Where It's At, and Where It's Headed". thefirearmblog.com. Retrieved 14 May 2017. ^ Trevithick, Joseph (10 May 2017). "The Army Is Once Again Looking to Replace the 5.56mm Cartridge". thedrive.com. Retrieved 15 May 2017. ^ Wayner, Josh (6 October 2016). "Why Universal Service Cartridges Will Never Happen". thetruthaboutguns.com. Retrieved 15 May 2017.